Gale Force Nine will be at first ever PAX Unplugged in Philadelphia, Pennsylvania at booth 556 in Expo Hall. 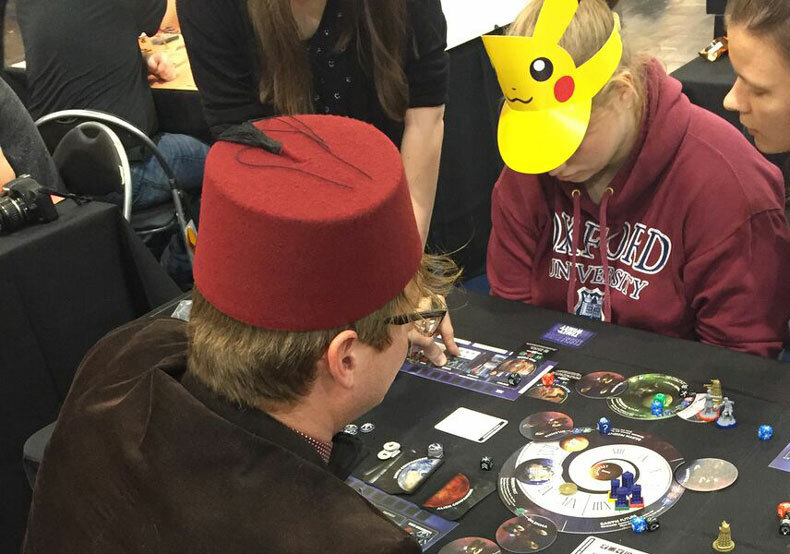 Our team will be demoing our newest games and expansions: Doctor Who: Time of the Daleks, Firefly Adventures: Brigands & Browncoats and Star Trek: Ascendancy – Borg Assimilation. We’ll also have a selection of GF9 games for sale at the show as well as our popular line of miniatures and accessories for Dungeons & Dragons! Be sure to pick up our show exclusive D&D models: Minsc & Boo, the bizarre Froghemoth, the Frost Giant Ravager, and the Fire Giant Dreadnought. And we’ll have the very latest D&D miniatures and accessories for Tomb of Annihilation available at the show. We’ll see you at PAXU! Visit Gale Force Nine at BGG.Con in Dallas, Texas. Join us at booth 812 in Aviators Hall where we’ll be playing games all weekend long. 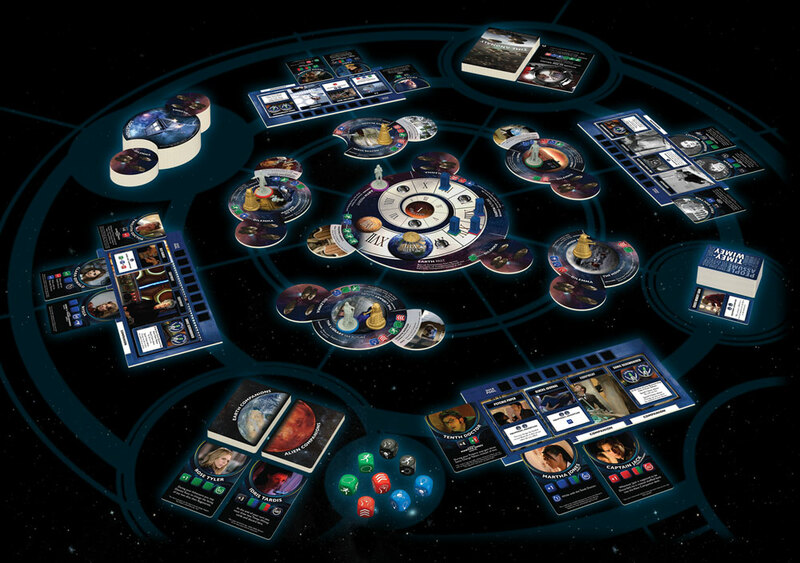 This will be your chance to play full games of Doctor Who: Time of the Daleks, Firefly Adventures: Brigands & Browncoats and Star Trek: Ascendancy – Borg Assimilation. Make sure you come by the booth on Thursday morning to reserve your space. 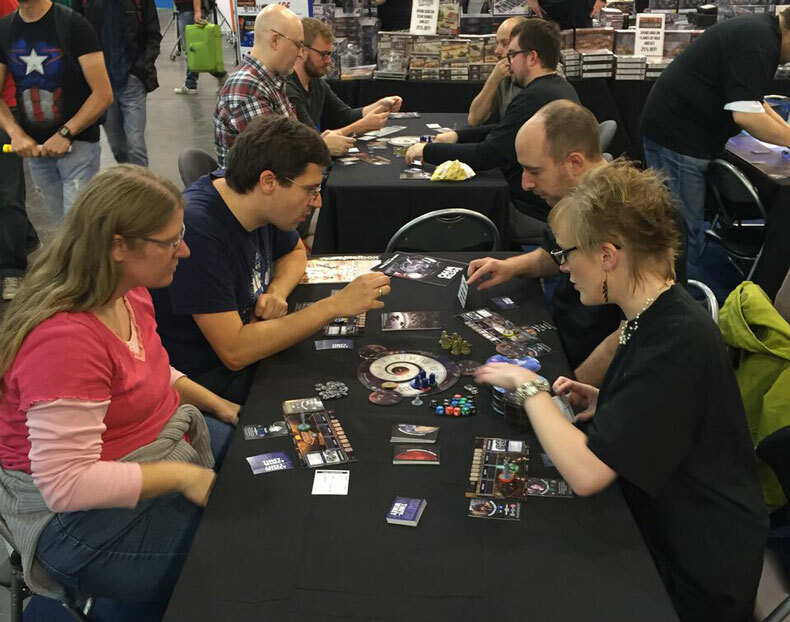 Doctor Who Materializes at Essen! 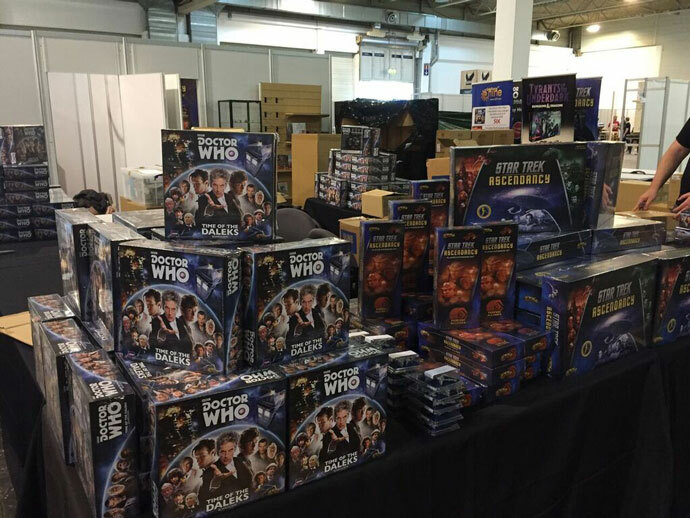 With the game printed in Germany, we had some copies of Doctor Who on hand to sell at the Essen show, while the rest of the games will be arriving shortly to our other warehouses, to be packed up and sent to pre-orders, stores, and distributors worldwide. Things are heating up at our Essen booth as players from all over flock to our tables to play and buy some of our latest games. 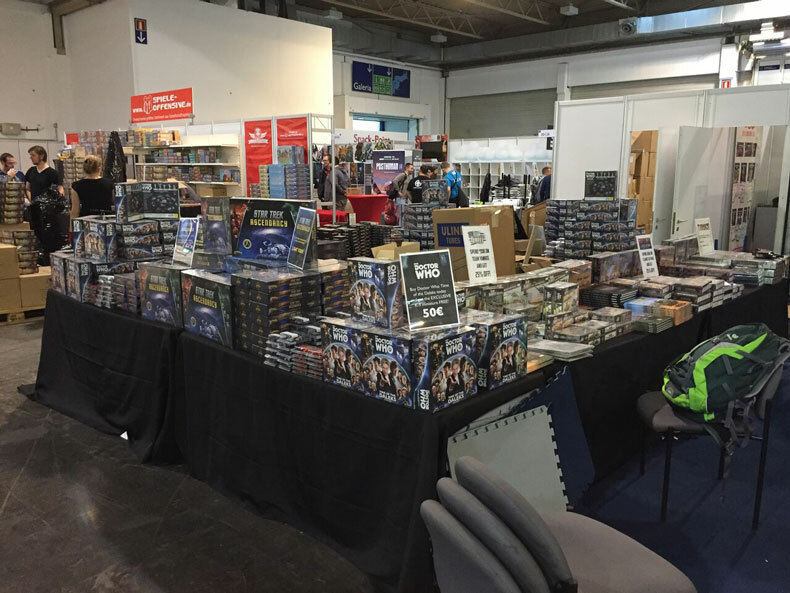 With the game printed in Germany, we had some copies of Doctor Who on hand to sell at the show, while the rest of the games will be arriving shortly to our other warehouses, to be packaged up and sent to pre-orders, stores, and distributors worldwide. If you are at Essen make sure you stop by Stand 2D138 to play some games or pick up your very own copy of Doctor Who Time of the Daleks. 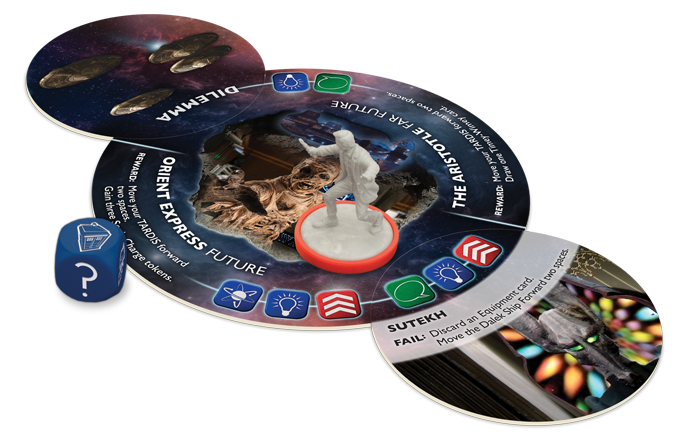 If you’re not at the show we’ve have something cool for you as well, we uploaded the full rulebook from the game for you to download Inside you will find out how to have adventures and recruit companions while traveling through time and space! We had a great time at Gen Con this year showing off Doctor Who Time of the Daleks and getting to know the players. During the convention, W. Eric Martin sat down with John-Paul Brisigotti to talk about the game and to get a feel for the rules. This week we are taking a closer look at the Daleks. In Doctor Who: Time of the Daleks, Davros has infiltrated the Matrix on Gallifrey, mapping out the Doctor’s timeline and devising the best way to wipe him from history. Dalek markers are placed on a Location if a Doctor fails a challenge and making it harder to complete the challenge in future. The Davros marker is the sixth Dalek marker. Place him last to remind players that all the Dalek markers are in play. 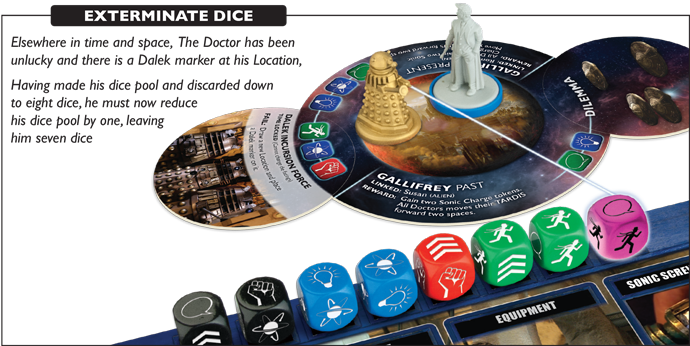 After discarding down to eight dice, The Doctor must Exterminate (discard) a further die for each Dalek marker at the Doctor’s current Location (regardless of which Time Zone the Dalek marker is in). As an exception to this, if The Doctor is on Earth, only Daleks in the same Time Zone as The Doctor Exterminate dice from his Dice Pool. The sixth and final Dalek marker is Davros, the creator of the Daleks. Once he has been placed, the Time of the Daleks is at hand. If you are ever required to place a seventh Dalek marker for any reason, the Time of the Daleks has arrived. The Daleks conquer the universe and the game ends immediately. This week we look at how Doctors can help each other during an Adventure, and how Regeneration works in the game. This week we are taking a closer look at the Eleventh Doctor. The Eleventh Doctor may not be the only Doctor to wear a bow tie, but he is definitely the Doctor that made it iconic. Of course, there is more to this Time Lord than a cracking bow tie. His great quotes and amazing episodes prove from day one that the Eleventh Doctor is indeed a madman in a box. The Eleventh Doctor has had some amazing companions during his regeneration: Amy Pond, the girl who waited; Rory Williams, the boy who waited even longer; River Song, his killer or his wife; and Clara Oswald, the impossible girl. "The universe is big, it’s vast and complicated, and ridiculous. And sometimes, very rarely, impossible things just happen and we call them miracles. And that’s the theory. Nine hundred years, never seen one yet, but this would do me." The Eleventh Doctor starts the game with Amy Pond. Because Amy is linked to Rory, he can easily join the Eleventh Doctor's TARDIS. 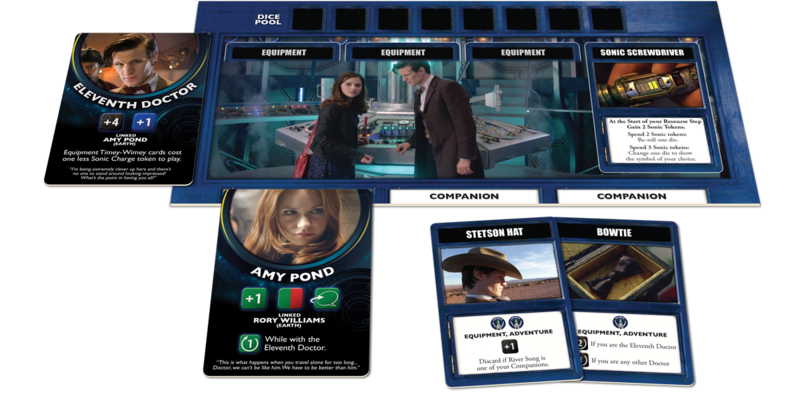 The Eleventh Doctor, Amy and Rory create a dynamic team that can automatically get some tough symbols. Between them they get plenty of Blue and Green dice. They don’t have much access to Red dice, though, so grabbing a red-focused companion like River Song or the Brigadier would be very useful. Like all of the Doctors, the Eleventh Doctor has a powerful unique ability. His makes equipment cards cheaper to play. 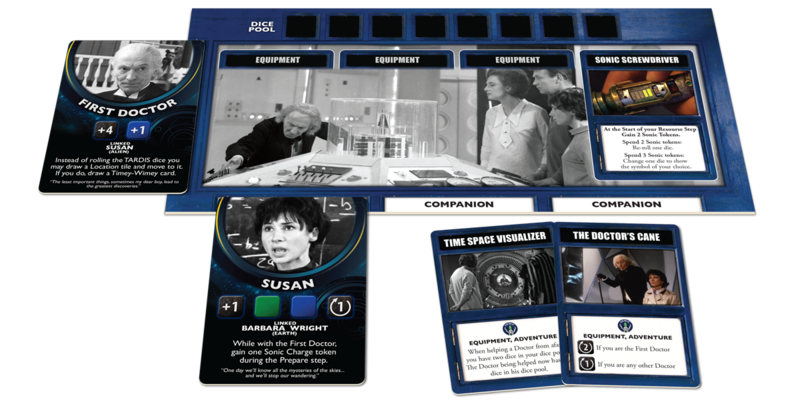 This comes in very handy in the first part of the game when the Doctors are trying to gather the resources they need to complete adventures and stop the Daleks. 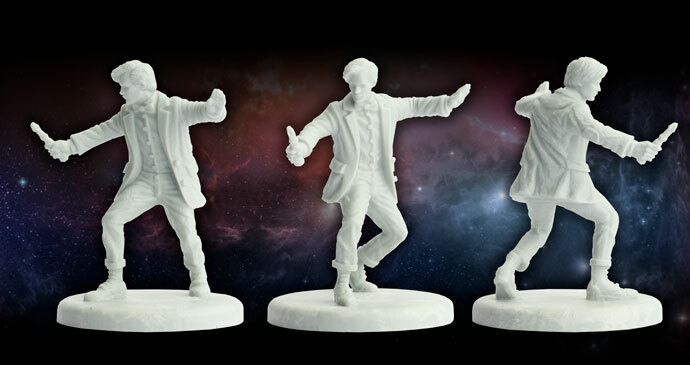 This week we take a look at movement rules and how to fly your TARDIS. We also take a closer look at Dilemmas, Locations and the TARDIS dice. 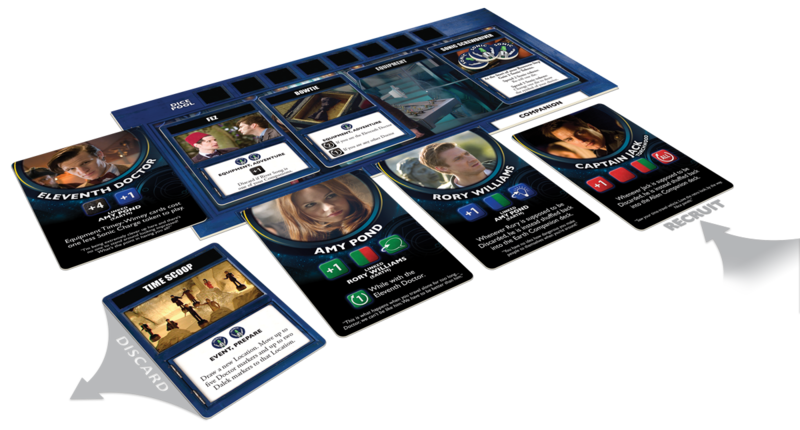 This week game designer Andrew Haught talks to us about the Twelfth Doctor and how he works in the game. 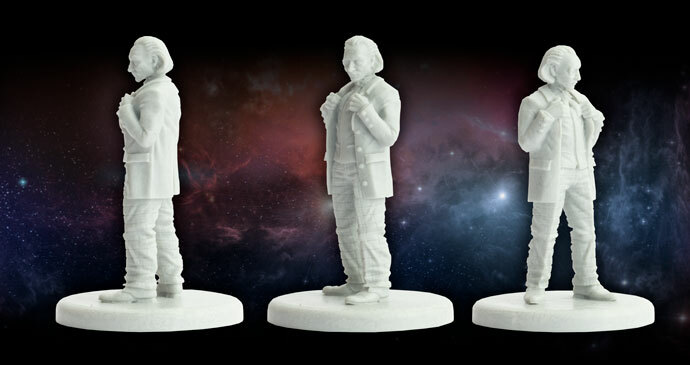 We also take a closer look at the Twelfth Doctor's Model.